The one thing you can do to better your oral health is practice good dental hygiene. 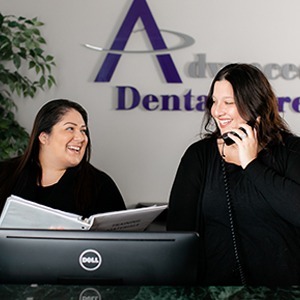 This requires a team effort between you and the team at Advanced Dental Care. Your role is daily brushing and flossing, and our role is providing you with professional dental cleanings and exams. At your twice-yearly dental checkups, one of our dental hygienists will thoroughly clean your teeth, removing plaque and tartar in order to reduce the risk of tooth decay and gum disease. Plaque is a biofilm that develops throughout the day in everyone’s mouth. And while plaque is natural, an accumulation of plaque can be a problem. Plaque harbors bacteria, and this bacterium converts the sugar in food into the acid that eventually causes cavities. Plaque also contributes to the development of gum disease – both gingivitis and periodontitis. When you come to Advanced Dental Care for your dental cleaning and exam, you can rely on our staff to carefully check your gums for any signs of periodontal disease. Why Choose Advanced Dental Care for Dental Hygiene? Choose a toothbrush with soft, rounded bristles, which are less likely to scratch tooth enamel the way hard bristles might. Use a pea-sized amount of fluoridated toothpaste when you brush. Any more will generate too much foam and make it more difficult to brush for as long as you should. And how long should you brush? At least two full minutes. Hold your toothbrush at a 45-degree angle to the gum line and brush in a circular motion, focusing on two or three teeth at a time. Be sure to brush all three surfaces of your teeth outside, inside, and along the chewing surfaces. Brush your tongue and the roof of your mouth, too. For flossing, cut off about 18 inches of floss and wind most around your middle fingers. Leave a couple of inches in between that you can grasp with your forefingers and thumbs. 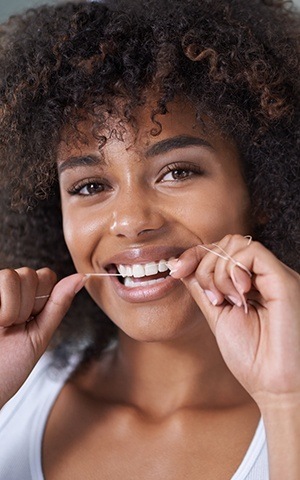 Guide the floss in between your teeth and gently move the floss up and down, making sure to clean beneath the gum line. Advance the floss as you go around your mouth. Call our Costa Mesa office to reserve an appointment for a dental checkup with Dr. Jorgenson. For your convenience, we offer several products in our office to enhance your at-home dental hygiene, including Oral B, Sonicare, Rotadent and Waterpik, as well as Crest, Colgate, and Sensodyne toothpastes and mouth rinses. We are happy to serve patients from Irvine, Newport Beach, Huntington Beach, and beyond.